As noted in the recent previous Synology product reviews, all of Synology's NASes operate using DiskStation Manager 6. DSM 6.1 provides a common set of features and a consistent user interface across all of Synology's products. Of course, some higher-end products support enhanced features, such as the BTRFS filesystem that isn't supported on J Series and Value Series products. If you want to take the user interface for a test drive, Synology has a live demo of the beta version of DSM 6.2. Of course, some admin features and well as cloud storage and file synchronization are disabled in the demo. DSM 6.1.4-15217 Update 3 firmware was loaded onto the DS918+ and performance tests were run using the Revision 5 NAS test process. All tests were run using Western Digital Red 1 TB WD10EFRX (x4 SNB supplied). Performance tests were run using the EXT4 filesystem. As noted earlier, I'll be comparing against the DS418j. File copy Write and File Copy Read results were consistent across all RAID levels (RAID 0, 5, & 10) for both NASes. All results were above 100 MB/s and approaching the theoretical limit of single client testing on a single Gigabit connection. The exception was the DS418j's RAID 5 File Copy Write performance of 94.9 MB/s. In general, the DS918+ outperformed the DS418j on most of the NASPT tests with the exception of the NASPT File Copy From NAS where the DS418j held a slight edge for all RAID levels. Neither NAS has USB 2.0 ports, so no USB 2.0 backup tests were run. The DS918+ has an eSATA port and those results were similar to the USB 3.0 results for the DS918+. For the USB 3.0 backup tests, the Network backup tests and the iSCSI read and write tests, the DS918+ outperformed the DS418j, with the exception of the USB 3.0 FAT format backup test. Using the NAS Ranker, I filtered for RAID5 class products, Test Method 5 and sorted by rank. The chart below shows the top three ranked NASes, with the DS918+ in #1 and DS418j in #3. Looking at the Ranker performance summaries, the DS918+ had category wins for every category except for Read Benchmarks. The DS418j just barely edged out the DS918+ largely because it had better NASPT File Copy From NAS scores. The DS918+ had significantly better category rankings for Write Benchmarks, Mixed Read Write, Backup and iSCSI categories. The Synology DS918+ and the DS418j DiskStations are very different devices, yet both scored well in our Total NAS rankings, finishing #1 and #3 respectively. The main reason for this is that our benchmarks don't include things that benefit from the 918+'s extra processing power, namely encrypted folders and media transcoding. Synology's published performance results include encryped folder performance, but not transcoding. They also use multiple aggregated ports for the sequential throughput test on NASes that have them and use Core i7 machines with a RAID0 SSD volume as clients, (but don't say how many machines are used). You can look through Synology's results and see if you think you can achieve similar results with your LAN devices. In most cases, we think not. One Synology benchmark most similar to our Windows filecopy test is shown below to provide a taste of Synology's benchmarking results. In the end, the DS918+lacks something that would provide benefit to folks who don't run lab-grade computers: a 10 GbE port. A bigger pipe would allow even single machines to break through the 125 MB/s barrier imposed by a single Gigabit Ethernet port—no link aggregation required! But Synology currently has no 10 GbE capable four-port NASes, while QNAP has three four-bays with built-in 10GbE and three with 10 GbE options. Of those, we've tested the four-bay TVS-471 and five-bay TS-563, which outrank the DS1817 and four-bay TS-453B and TS-431X that do not. Synology's least expensive 10 GBE options are the $849 eight-bay DS1817 with two built-in 10GbE copper ports and $789 five-bay DS1517+, which requires a 10 GbE board that brings total cost up over $1000. The DS1517+ ranks #1 in our NAS Ranker's RAID5-10GbE class, while the DS1817 ranks #5. 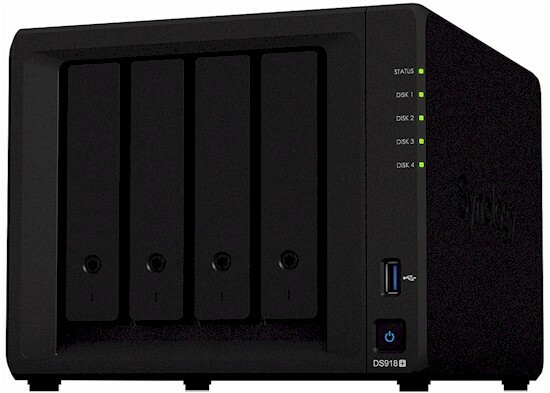 But if you're just looking for a RAID5 capable NAS capable of maxing out a single Gigabit Ethernet connection, the $300 DS418j would be a better way for you to give Synology your money.